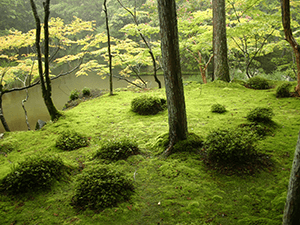 The Koke-iro, it is a dark yellow-green as the color of the moss plant. Is what is called a moss, there is also approximately two thousand kinds of Japan is a general term such as moss moss plants, such as Su. By the way, words such as “moss” and “Kokekoromo” is also seen peace literature, which is pointing to poor clothes of hermit monks and likened to batter the moss, not a color name. The color of the prone, in color which arranged the “light green light green front and dark, dark back,” and was used in the summer.